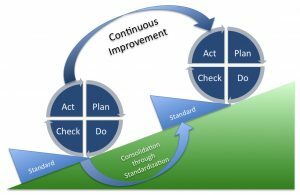 PDCA (plan–do–check–act) is an iterative four-step management method used in business for the control and continual improvement of processes and products. Another fundamental function of PDCA is the separation of each phase, for if not properly separated measurements of effects due to various simultaneous actions (causes) risk becoming confounded. Plan: Define the problem to be addressed, collect relevant data, and ascertain the problem’s root cause. Make a plan and schedule, for example via an A3 form. Request agreement.